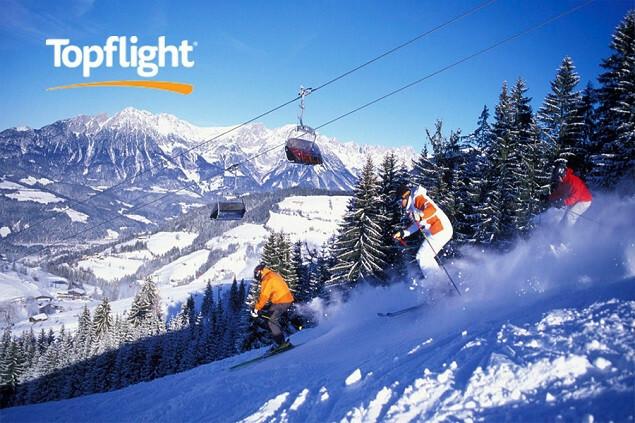 Take a trip for 2 to the slopes of Söll, with Topflight, Ireland’s no.1 ski tour operator. Rewarding Times, together with Topflight, the award-winning ski tour operator, are offering an incredible ski holiday for two to the spectacular slopes of Söll this winter. Stay in the cosy and welcoming, family-run, Hotel Austria for 7 nights on a bed & breakfast basis, from the 5th of January 2019. Flights, transfers, 20kg luggage allowance and Topflight’s resort manager service are all included in the price. Celebrated for its unbelievable ski opportunities, Söll is the main gateway to 280m of slopes in Austria’s largest interconnected ski network. Not only that, it is widely regarded as the liveliest resort in the SkiWelt, meaning that not only do visitors get the best ski but they can also make use of the fantastic après-ski atmosphere too. Enjoy Söll’s night-time skiing, with uncrowded, well-lit and immaculately groomed slopes to blast down and make use of the hugely enjoyable toboggan run next to the slopes too. Travelling to Söll in January really ticks all the boxes. Bid ‘auf wiedersehen’ to the blues, avoid the crowds and enjoy some unbeatable conditions to really kick start your new year. This popular family-run accommodation is a favourite with visitors year after year due to its outstanding, friendly service. Situated right in the centre of the resort, offering easy access to bars, restaurants and some lively nightlife, and just a 15 minute walk to gondola linking skiers to the 90 cable cars and lifts in the SkiWelt area, it’s easy to see why this little gem is so well loved. The rooms in the hotel are warm and cosy, yet spacious and tastefully decorated and they come equipped with everything that you could need for a comfortable stay. And if after a day on the slopes, exerting yourself, you don’t feel like venturing out in the evening, the hotel’s quaint bar is the perfect place to enjoy a relaxing après-ski drink. Price is based on 2 adults sharing, with a stay for 7 nights in the 3 star Hotel Austria in Söll, on a bed & breakfast basis. This holiday must be taken on the selected date of 5th of January 2019 and is subject to availability. There are 6 rooms available for this offer. Offer includes return flights from Dublin to Salzburg, return transfers, 20kg baggage allowance, 7 nights accommodation in the 3 star Hotel Austria on a bed & breakfast basis, all taxes and a rep service in resort. Once you have received your voucher, please contact Topflight Holidays with your voucher number, name and address, no later than 23rd November 2018.